We are very proud to have teamed up with IWM - Imperial War Museums to offer you exclusive insight into the historic events and location that inspired the Universal Pictures motion picture Darkest Hour, starring Golden Globe winner Gary Oldman (playing at Curzon Cinemas from Friday 12 January). Below you will also find details of our competition to win a visit to Churchill War Rooms in London and a copy of IWM publication Secrets of Churchill War Rooms. At this must-see historic site, visitors can walk in the footsteps of Winston Churchill, and take a glimpse what life would have been like during the tense days and nights of the Second World War. 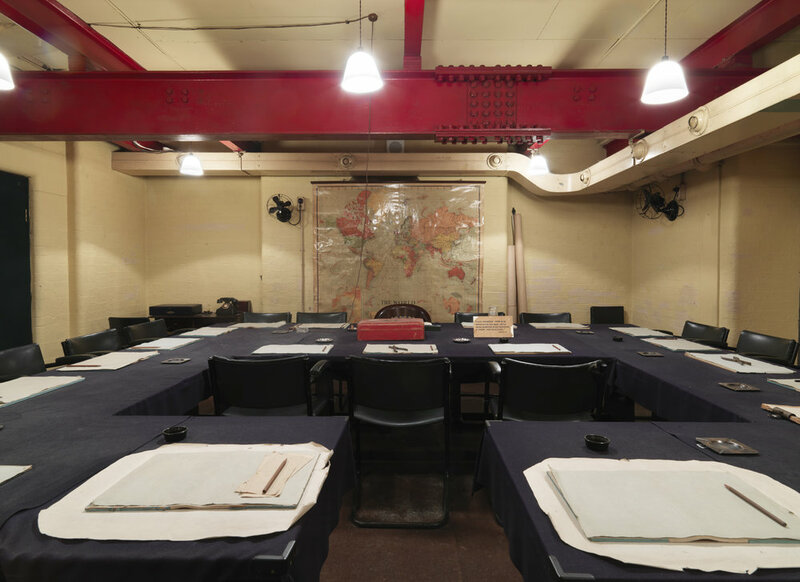 Step back in time to the Second World War in the Map Room, which has remained exactly as it was left on the day the lights were switched off in 1945, and visit the Cabinet Room, Churchill’s bedroom and the Transatlantic Telephone room, which all feature in Darkest Hour. These rooms were recreated by the film’s set designers, who spent months painstakingly researching in the real Churchill War Rooms, before building a replica set at Ealing Studios. 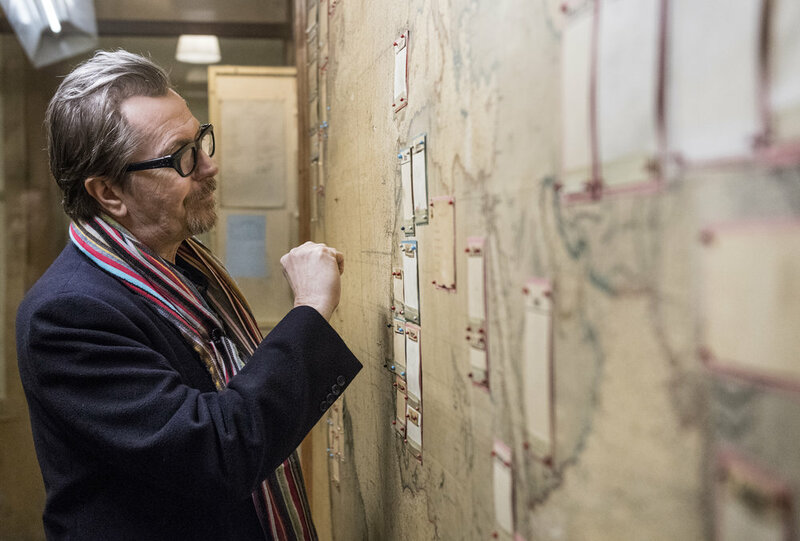 Churchill War Rooms was also visited by Gary Oldman, Lily James and the film’s director Joe Wright as part of the research for the film. This was the room where Churchill held 115 meetings with his most senior political and military advisors. Many of those meetings went on late into the night. With so much at stake, they could be tense affairs, with terse, sometimes angry exchanges between the participants. 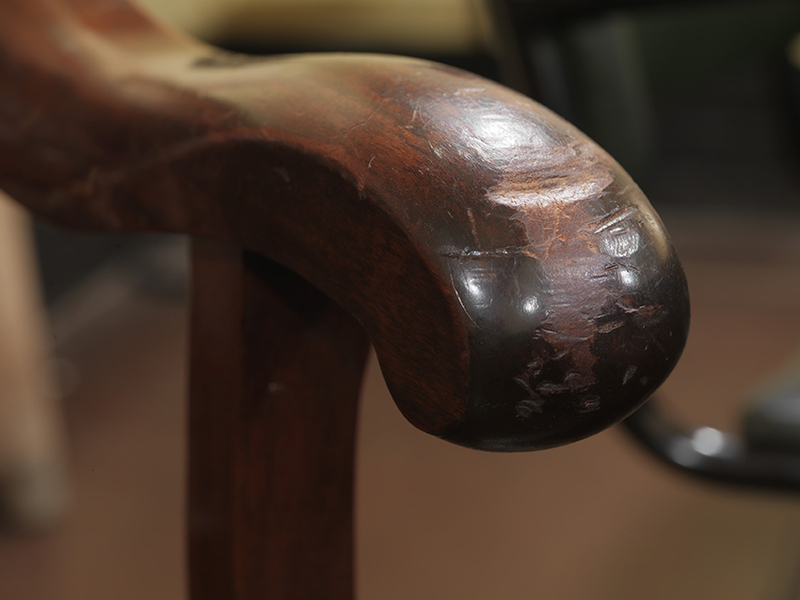 The wooden arms of Churchill’s chair in the Cabinet Room bear scratch marks which reveal the energy of its occupant. The meetings were also conducted in a haze of tobacco smoke - ashtrays are liberally placed on the tables - much of which came from the prime minister’s cigars. He smoked around eight cigars a day, constantly lighting and relighting them. Churchill’s love of cigars began in 1895, when as a young officer he went to Cuba to observe fighting between Spanish army and Cuban guerrillas. While there he also discovered the pleasures of the afternoon ‘siesta’ and, for the rest of his life he would take a nap for an hour or so at around 3pm. During the tense meetings in the Cabinet Room, Churchill would sit in a distinctive wooden chair which is on display for visitors at Churchill War Rooms, and which is replicated in Darkest Hour. The wooden arms of Churchill’s chair are gouged with scratch marks that speak volumes for the nervous energy of its occupant. The marks differ on each arm: Churchill’s right hand appears to have scratched at the wood, while the signet ring on his left made deeper gouges. In Darkest Hour Churchill expresses his dislike of noisy typewriters. Churchill insisted on a quiet working environment and ordered that his staff should use special noiseless typewriters imported from the United States. Visitors can see a real noiseless typewriter in the 'Undercover: Life in Churchill’s Bunker' section in the Churchill Museum, part of Churchill War Rooms.. The War Rooms were designed to protect the prime minister and his advisors from air raids. Yet Churchill was not a man for being underground. We have no record of him actually having spent the night in this bedroom and, just above the War Rooms, he had a far more luxurious suite of rooms known as the ‘No 10 Annexe’. These were far better suited to a man described by one of his friends as ‘easily satisfied with the best of everything’. On the bedroom table you will see broadcasting equipment. In the early days of the Second World War, when Britain was faced with surrender or a fight for survival, Churchill’s speeches were at their most effective. Radio was the main way of speaking to the nation. A broadcast by Churchill was a major event, especially in 1940-1941. While not everyone could afford a ‘wireless set’, people could listen in factories, barracks, pubs and at their neighbours’ homes. Churchill wrote all of his speeches himself and it has been estimated that thirty minutes of writing, dictation, rehearsal and refinement went into every minute that he actually spoke. In Darkest Hour Churchill enters the Transatlantic Telephone Room at Churchill War Rooms to make a call to the United States. In this tiny room – formerly a broom cupboard - Churchill held top secret conversations with US President Franklin D Roosevelt on a direct line. When Churchill became Prime Minister, one of his main aims was to secure the active support of the United States, with its military and economic power. The telephone room, to which the scrambler 'Sigsaly' was connected, created the original hot-line allowing Churchill and Roosevelt to conduct their vital strategic discussions in complete security. The scrambling equipment was so large that it had to be installed in an annexe basement of Selfridges department store in Oxford Street. Partially encoded telephone conversations were transmitted by cable from the 'hot-line' to the Selfridges site where it was finally enciphered and sent by radio waves to the President in Washington. Anyone passing the room would have assumed that it had a far more basic function as a toilet – on the door is a ‘Vacant and ‘Engaged’ lock. 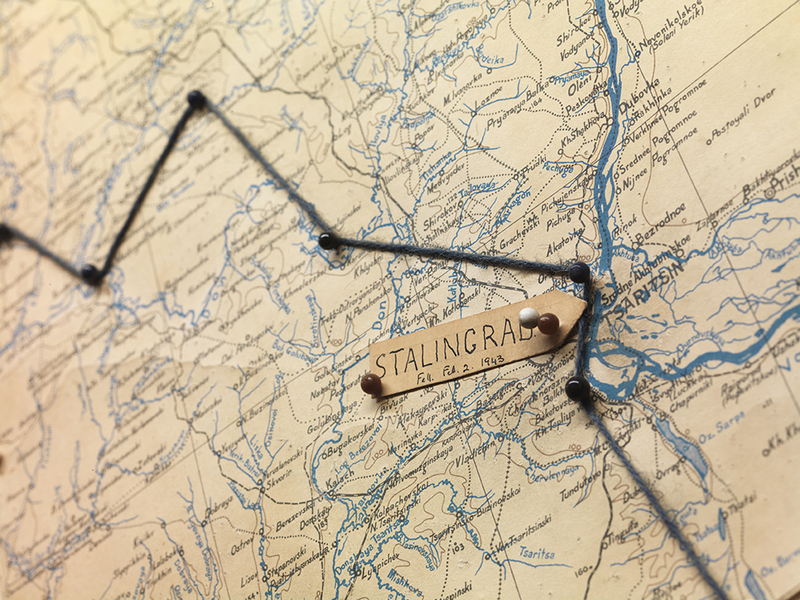 The map room was the beating heart of the Churchill War Rooms and a constant bustle of activity. It was staffed 24 hours a day by map officers from the Army, Royal Navy and Royal Air Force. Here, Churchill, senior politicians and military commanders could follow the very latest news on the fighting, as France fell to German forces, as bombs rained down on London and other British cities, and, from 1944, as Allied forces advanced towards victory. On one wall is a map with thousands of pinpricks showing the locations of the convoys of ships which – at the cost of so many lives - carried the vital weapons and supplies that kept Britain fighting. A line of coloured telephones known as ‘the beauty chorus’ connected the Room to government ministries and headquarters. Scrambling devices were fitted to the phones in case any of the lines were tapped. If you look carefully you will also see some sugar cubes, a precious commodity in wartime Britain. These were kept by Wing Commander John Heagerty in a desk drawer. They remained hidden there until the Imperial War Museum took over the site in the early 1980’s. Featured in Darkest Hour is the door to number 10 Downing Street. As part of visitors’ trip to the War Rooms, they can see the real door to Number 10 that was in use during Churchill's time as Prime Minister on display in the Churchill Museum. It dates back to Henry Pelham’s era as Prime Minister in the early 1750s and is thought likely to be the original door from Robert Walpole’s leadership in 1735. It was through this very door Winston Churchill walked for the first time as Britain’s Prime Minister in May 1940, aged 65. It is on display in the Churchill Museum, a permanent exhibition within the Churchill War Rooms in which you can explore the whole life of this extraordinary human being. There you will meet not just Churchill the statesman, but also Churchill the schoolboy, the soldier, the journalist, writer, painter and family man. As the museum shows, his path to prime minster was anything but inevitable. He was a man who, throughout his life and career, was seen by many as a warmonger, an opportunist and adventurer and he made as many enemies as he did friends. Win a pair of adult tickets for entry to Churchill War Rooms and a copy of IWM publication Secrets of Churchill War Rooms. Please note: by entering your details for the purpose of this competition, you agree to receive email communications from Curzon. You may unsubscribe any time. Choose only ONE correct answer. Thank you for entering the competition! If you are the winner, we will contact you via email to arrange your prize. The competition ends at midnight on Monday 22 January 2018. The winner will be contacted via email around that date by the Curzon Cinemas team. Darkest Hour plays at Curzon Cinemas from Friday 12 January. Book now. With thanks to IWM and Universal Pictures. There is 1 (one) prize including a pair of adult tickets to visit Churchill War Rooms and 1 x copy of the Secrets of Churchill’s War Rooms book. The prize is not exchangeable or transferable and cannot be redeemed for cash. Entry is open to those who are not employees or contractors of IWM or immediate family members of employees or contractors of IWM. The IWM reserves the right to alter and/or cancel the prize without any prior warning. All personal data submitted with consent will be kept by the IWM and Curzon for the purpose of sending out the prize. Entry is open to UK residents aged 18 or over. Entry is open to those who are not employees or contractors of the promoter or immediate family members of employees or contractors of the Promoter. Competition is open to those aged 18 and over. By entering the competition you agree to sign up to Curzon email and newsletters. You may unsubscribe at any time.